When looking for knowledge, let's not just rely on finding the experts. We know that actually only a small percentage of knowledge in an organisation can be accessed through documents, and that most of it is in the heads of people. We know that if we can "find the people who know", then we can access that tacit knowledge through asking them questions. One common approach to "finding the people that know" is to build an Expert Locator System. You think - "Who are the experts in the organisation? Can we make an index of the experts, so that people can find them, and ask them for advice?" 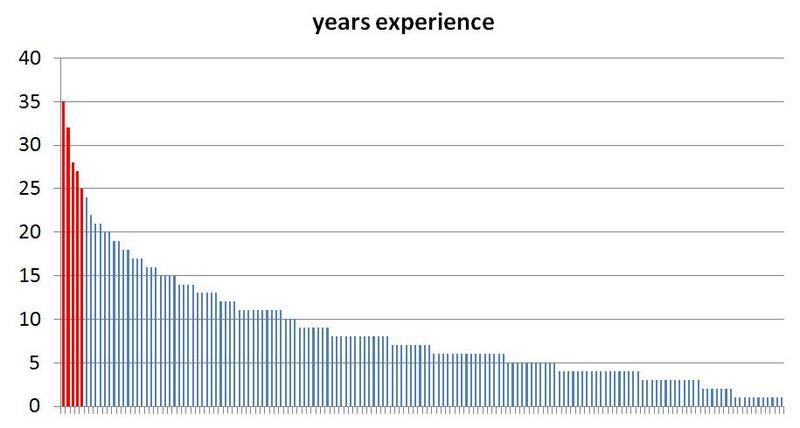 Consider the graph above - a plot of the years experience in an imaginary company. We see red bars and blue bars - the red bars are the Experts, who have 35, 32, 28, 27 and 25 years of experience - a total of 17 years. The blue bars are the workers. They individually have fewer years of experience, but there are a lot of them, and their collective experience adds up to 1187 years of experience - 8 times more than the experts. So if you need an answer to a problem, and if you want to tap into the experience of others, where is that relevant experience likely to sit? 8 times out of 9 (in this example) it will sit it the Long Tail of experience, not in the Short Head of the Experts. Does this happen in practice? Do we get answers from less experienced workers rather than from more experienced experts? I think in real life - where knowledge exists in context, where contexts vary widely, and where many staff see knowledge in many contexts, then this happens quite a lot. Here is a story from a real company. "I had written a report on the success of a particular operation in my business in the USA, and I made this report because one of my managers asked me to do this to support a decision. I was able to document some of our information from the last 4 year to help this decision. This is was a significant thing for my team, but it turned out to be significant for other teams as well. I saw a question through the web system asking "what has been the success of this operation in the company?". This was a question from a team in Africa, and it was a close enough scenario to the scenario for which I had written my report. You feel the Power - you feel the power of knowledge and the value that it might represent when you receive a response "Thank you very much for your reply, because this actually helped us to make a decision". It was an incredible experience to answer a question in the forum, with only 2 1/2 years experience in the company, and already being able to advice the whole world on the things we do and how we do it". So when you create your systems for tapping into tacit knowledge - your Expertise Locators, your "Ask a question" functionality - do not fall into the trap of involving only the few Company Experts. Remember the long tail, which may contain nearly 90% of the experience and knowledge, and include those guys as well. - With long terms of service comes memory issues - tacit knowledge can be forgotten! - And, as I think you've pointed out before, relevancy is all important. I think it was from Leif Edvinsson that I first heard of re-framing 'recruitment' as 'insourcing knowledge - and by that token, I'd say there's no basis for evaluation 'knowledge' purely on length of service. Even a 'junior' can come up with a relevant answer where multiple 'seniors' are still scratching their heads. And visa versa. What's more important is the specific piece of knowledge that is applicable to a specific situation. Excellent insight. It is a good reminder that there is collective knowledge and experiences among the less tenured who would be enthusiastic to share. A thought strikes me here- the experts have more wholesome knowledge because of their longer experience; while the younger set will have specific knowledge on some aspects.